Coughlin & Gerhart, LLP is a multi-service, progressive law firm consisting of more than 40 active lawyers and a professional staff. We provide outstanding legal services both regionally and across the State of New York. A large number of our lawyers have been selected for inclusion in various editions of the “Super Lawyers” and “Best Lawyers" in America publications. We utilize a variety of billing methodologies that best fit the needs of our clients. Coughlin & Gerhart, LLP has its main office in Binghamton, New York. The firm also maintains offices in Ithaca, Owego, Bainbridge, Hancock, and Walton, NY and Montrose, PA.
Coughlin & Gerhart, LLP is one of the most established law firms in the Southern Tier of New York, dating back to the 1890s. The firm and its many partners have played an integral role in the development of the Broome County and surrounding areas. All of our lawyers are encouraged to participate and take leadership roles in the community, as well as in bar association activities. Coughlin & Gerhart has produced two Presidents of the New York State Bar Association, a Vice President of the State Bar, a chair of the New York Conference of Bar Leaders, judges and authors, as well as majority and minority leaders of the New York State Assembly. Other partners were instrumental in the establishment of the Roberson Museum and Science Center, and the Broome County Airport. The lawyers of the firm continue to be deeply involved in the Broome County community’s political, cultural, business and economic development. Coughlin & Gerhart remains committed to our founders’ ideals of quality, integrity and service. The lawyers who fill the firm’s ranks today are dedicated to maintaining a tradition of excellence. To better serve our clients, we are organized into six basic Practice Groups: Business and Banking Law, Labor and Employment Law, Litigation, Public Law, Real Estate, and Trusts and Estates. 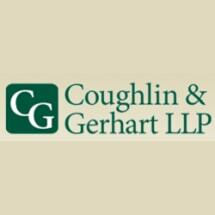 In addition to our main Practice Groups, Coughlin & Gerhart offers services in the areas of Oil & Gas Law, Family Law, Criminal Law, and Immigration Law. Complex matters within each practice area are supervised by lawyers experienced in the type of matter being handled. Because of the size of the office and diversity of the attorneys in the firm, lawyers from one practice group are able to routinely assist and augment lawyers in another group. Each group meets on a periodic basis to discuss the status of assigned and new matters, as well as current developments in the law.